A wall of glass and your forty foot screened deck, look out on the sunset and wild birds fishing in the multicolored waters of the Florida Bay. This top floor corner unit has tranquility and beauty galore. No other buildings anywhere spoil the moment. Yet just a mile up the road is the heart of Islamorada, with the best fishing, entertainment and restaurants in the Keys. Discover heaven, the way it was meant to be. 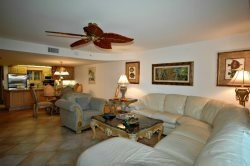 This spacious, 2 bedroom, 2 bath unit is the premier location in this small, private complex tucked into a mangrove reserve near the center of Islamorada, The pool is surrounded by nothing but nature, and a private boardwalk takes you to the Florida Bay. The open floor plan beckons you to come in and relax in the luxurious sanctuary, with exquisite sunset views, widescreen HD-TV and a master bath jacuzzi for the end of the day.